Yesterday one of my wife’s friends came over to visit, and we decided on a lark to watch the Oscars (which we haven’t done most years). Even though we pay for Cable and are avid TiVo users, due to a variety of circumstances we missed both the beginning of the Oscars and–more importantly–the entire finale, from best female actress through best picture. My frustration and indignation led to me to think systematically about the various ways that technology could and should have helped us avoid this problem. I decided to share my thoughts in the hope that better understanding technology’s current limitations will help inspire and illuminate the way to improving them. As usual, I welcome your feedback, comments, and additional thoughts on this topic. As a result of not having scheduled the Oscars to record in advance, when we turned on the TV it turned out that the red carpet pre-show had started 15 minutes ago. Sadly, there was no way to go back and watch the 15 minutes we had missed. Normally TiVo buffers the last 30 minutes of live TV, but when you change channels, it wipes out the buffer, and in this case we were not already on the channel where the Oscars were being recorded. Yet clearly this content could and should be easily accessible, especially when it just happened–you could imagine a set of servers in the cloud buffering the last 30 minutes of each channel, and then providing a similar TiVo-like near-past rewind feature no matter which channel you happen to change to (this would be a lot easier than full on-demand since the last 30 minutes of all channels is a tiny subset of the total content on TV). We had no information that the Oscars was likely to run long. Actually, that’s not entirely true. Once we discovered our error, my wife’s friend remarked, “oh yeah, the Oscars always runs long”. Well, in that case, there should be ample historical data of the expected chance that a repeated live event like the Oscars should have extra time appended to the recording, and TiVo should be able to present that data to help its users make a more informed choice about whether to add additional recording time. If failure #1 was addressed, this whole issue would me moot, but in the interim, if TiVo is going to pass the buck to its users to decide when to add recording time, it should at least gather enough information to help the user make an informed choice. We weren’t able to go back and watch the TV we had missed, even though nothing else was being recorded during that time. Even though we hadn’t specifically told TiVo to record past the scheduled end of the Oscars, we also hadn’t told it to record anything else. So it was just sitting there, on the channel we wanted to record, doing nothing. Well, actually it was buffering more content, but only for 30 minutes, and only until it changed channels a few hours later to record some other pre-scheduled show. With hard drives as cheap as they are today, there’s no reason TiVo couldn’t have kept recording that same channel until it was asked to change channels. You could easily imagine an automatic overrun-prevention scheme where TiVo keeps recording say an extra hour after each scheduled show (unless it’s asked to change channels in the interim) and holds that in a separate, low-priority storage area (like the suggestions it records when extra space is free) that’s available to be retrieved at the end of a show (“The scheduled portion of this show has now ended, but would you like to keep watching?”), provided you watch that show soon after it was first recorded. In this case, it was only a few hours after the scheduled show had ended, so TiVo certainly would have had the room and ability to do this for us. Dismayed at our failure to properly record the Oscars finale, we hoped that online content delivery had matured to the point where we could just watch the part we had missed online. After all, this is a major event on a broadcast channel whose main point is to draw attention to the movie industry, so if there were ever TV content whose owners should be unconflicted about maximizing viewership in any form, this should be it. But again, here we failed. First of all, there was no way to go online without seeing all the results, thus ruining the suspense we were hoping to experience. One could easily imagine first asking users if they had seen the Oscars, and having a separate experience for those wanting to watch it for the first time vs. those merely wanting a summary or re-cap. But even despite that setback, there was no way to watch the finale online in its entirety. The official Oscars website did have full video of the acceptance speeches, which was certainly better than nothing, but we still missed the introductions, the buildup, and so on. It blows my mind that you still can’t go online and just watch the raw feed, even of a major event on a broadcast channel like ABC, even when the event happened just a few hours ago. In this case it seems hard to believe that the hold-up would be a question of whether the viewer is entitled to view this content (compared to, say, some HBO special or a feature-length movie), but even if it were, my cable company knows that I pay to receive ABC, and presumably has this information available digitally somewhere. Clips are nice, but ABC must have thought the Oscars show was worth watching in its entirety (since it broadcast the whole thing), so there should be some way to watch it that way online, especially soon after it aired (again, this is a simpler problem than archiving all historical TV footage for on-demand viewing). Of course, there is one answer here: I’m sure I could have found the full Oscars recording on bittorrent and downloaded it. How sad (if not unexpected) that the “pirates” are the closest ones to delivering the user experience that the content owners themselves should be striving for! Finally, aside from just enabling me to passively consume this content I wanted, I couldn’t help but notice a lot of missed opportunity to make watching the Oscars a more compelling, consuming, and social experience. 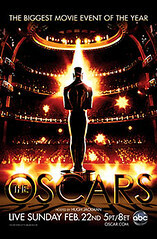 For instance, I had very little context about the films and nominees–which were expected to win? Who had won or been nominated before? Which were my friends’ favorites? In some cases, I didn’t even know which actors had been in which films, or how well those films had done (both in the box office and with critics). An online companion to the Oscars could have provided all of this information, and thus drawn me in much more deeply. And with a social dimension (virtually watching along with my friends and seeing their predictions and reactions), it could have been very compelling indeed. If such information was available Online, the broadcast certainly didn’t try to drive any attention there (not even a quick banner under the show saying “Find out more about all the nominees at Oscar.com”, at least not that I saw). And my guess is that whatever was online wasn’t nearly interactive enough or real-time enough for the kind of “follow along with the show and learn more as it unfolds” type of experience I’m imagining. And even if such an experience were built, my guess is it would only be real-time with the live broadcast. But there’s no reason it couldn’t prompt you to click when you’ve seen each award being presented (even if watching later on your TiVo) and only then revealing the details of how your pick compared to your friends and so on. I recently helped Dave Winer debug his OAuth Consumer code, and the process was more painful than it should have been. (He was trying to write a Twitter app using their beta OAuth support, and since he has his own scripting environment for his OPML editor, there wasn’t an existing library he could just drop in.) Now I’m a big fan of OAuth–it’s a key piece of the Open Stack, and it really does work well once you get it working. I’ve written both OAuth Provider and Consumer code in multiple languages and integrated with OAuth-protected APIs on over half a dozen sites. I’ve also helped a lot of developers and companies debug their OAuth implementations and libraries. And the plain truth is this: it’s empirically way too painful still for first-time OAuth developers to get their code working, and despite the fact that OAuth is a standard, the empirical “it-just-works-rate” is way too low. We in the Open Web community should all be concerned about this, since OAuth is the “gateway” to most of the open APIs we’re building, and quite often this first hurdle is the hardest one in the entire process. That’s not the “smooth on-ramp” we should be striving for here. We can and should do better, and I have a number of suggestions for how to do just that. To some extent, OAuth will always be “hard” in the sense that it’s crypto–if you get one little bit wrong, the whole thing doesn’t work. The theory is, “yeah it might be hard the first time, but at least you only have to suffer that pain once, and then you can use it everywhere”. But even that promise falls short because most OAuth libraries and most OAuth providers have (or have had) bugs in them, and there aren’t good enough debugging, validating, and interop tools available to raise the quality bar without a lot of trial-and-error testing and back-and-forth debugging. I’m fortunate in that a) I’ve written and debugged OAuth code so many times that I”m really good at it now, and b) I personally know developers at most of the companies shipping OAuth APIs, but clearly most developers don’t have those luxuries, nor should they have to. After I helped Dave get his code working, he said “you know, what you manually did for me was perfect. But there should have been a software tool to do that for me automatically”. He’s totally right, and I think with a little focused effort, the experience of implementing and debugging OAuth could be a ton better. So here are my suggestions for how to help make implementing OAuth easier. I hope to work on some or all of these in my copious spare time, and I encourage everyone that cares about OAuth and the Open Stack to pitch in if you can! Write more recipe-style tutorials that take developers step-by-step through the process of building a simple OAuth Consumer that works with a known API in a bare-bones, no-fluff fashion. There are some good tutorials out there, but they tend to be longer on theory and shorter on “do this, now do this, now you should see that, …”, which is what developers need most to get up and running fast. I’ve written a couple such recipes so far–one for becoming an OpenID relying party, and one for using Netflix’s API–and I’ve gotten tremendous positive feedback on both, so I think we just need more like that. Standardize the terms we use both in our tutorials and libraries. The spec itself is pretty consistent, but it’s already confusing enough to have a “Consumer Token”, “Request Token”, and “Access Token”, each of which consist of a “Token Key” and “Token Secret”, and it’s even more confusing when these terms aren’t used with exact specificity. It’s too easy to just say “token” to mean “request token” or “token” to mean “token key”–I do it all the time myself, but we really need to keep ourselves sharp when trying to get developers to do the right thing. Worse still, all the existing libraries use different naming conventions for the functions and steps involved, so it’s hard to write tutorials that work with multiple libraries. We should do a better job of using specific and standard terms in our tutorials and code, and clean up the stuff that’s already out there. Consolidate the best libraries and other resources so developers have an easier time finding out what the current state-of-the-art is. Questions that should have obvious and easily findable answers include: is there an OAuth library in my language? If so, what’s the best one to use? How much has it been tested? Are their known bugs? Who should I contact if I run into problems using it? What are the current best tutorials, validators, etc. for me to use? Which companies have OAuth APIs currently? What known issues exist for each of those providers? Where is the forum/mailing-list/etc for each of those APIs? Which e-mail list(s) should I send general OAuth questions to? Should I feel confident that emails sent to those lists will receive prompt replies? Should I expect that bug reports or patches I submit there will quickly find their way to the right place? And so on. Share more war stories of what we’ve tried, what hasn’t worked, and what we had to do to make it work. I applauded Dave for suffering his developer pain in public via his blog, and I did the same when working with Netflix’s API, but if we all did more of that, our collective knowledge of bugs, patterns, tricks, and solutions would be out there for others to find and benefit form. I should do more of that myself, and if you’ve ever tried to use OAuth, write an OAuth library, or build your own provider, you should too! So to get things started: In Dave’s case, the ultimate problem turned out to be that he was using his Request Secret instead of his Access Secret when signing API requests. Of course this worked when hitting the OAuth endpoint to get his Access token in the first place, and it’s a subtle difference (esp. if you don’t fully grok what all these different tokens are for, which most people don’t), but it didn’t work when hitting a protected API, and there’s no error message on any provider that says “you used the wrong secret when signing your request” since the secrets are never transmitted directly. The way I helped him debug it was to literally watch our debugging logs (which spit out all the guts of the OAuth signing process, including Base String, Signature Key, and final Signature), and then I sent him all that info and asked him to print out the same info on his end and compare the two. Once he did that, it was easy to spot and fix the mistake. But I hope you can see how all of the suggestions above would have helped make this process a lot quicker and less painful. 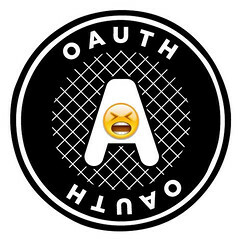 What else can we as a community do to make OAuth easier for developers? Add your thoughts here or in your own blog post. As Dave remarked to me, “the number of OAuth developers out there is about to skyrocket” now that Google, Yahoo, MySpace, Twitter, Netflix, TripIt, and more are providing OAuth-protected APIs. So this is definitely the time to put in some extra effort to make sure OAuth can really achieve its full potential! The quest to open up the Social Web is quickly shifting from a vision of the future to a vision of the present. Last week we reached an important milestone in delivering concrete benefits to mainstream users from the Open Stack. Together with Google, we released a new way to join Plaxo–without having to create yet-another-password or give away your existing password to import an address book. We’re using a newly developed “hybrid protocol” that blends OpenID and OAuth so Gmail users (or any users of a service supporting these open standards) can, in a single act of consent, create a Plaxo account (using OpenID) and grant access to the data they wish to share with Plaxo (using OAuth). We’re testing this new flow on a subset of Plaxo invites sent to @gmail.com users, which means we can send those users through this flow without having to show them a long list of possible Identity Provider choices, and without them having to know their own OpenID URL. The result is a seamless and intuitive experience for users (“Hey Plaxo, I already use Gmail, use that and don’t make me start from scratch”) and an opportunity for both Plaxo and Google to make our services more interoperable while reducing friction and increasing security. I’m particularly excited about this release because it’s a great example of “putting the pieces together” (combining multiple Open Stack technologies in such a way that the whole is greater than the sum of the parts), and it enables an experience that makes a lot of sense for mainstream users, who tend to think of “using an existing account” as a combination of identity (“I already have a gmail password”) and data (“I already have a gmail address book”). And, of course, because this integration is based on open standards, it will be easy for both Google and Plaxo to turn around and do similiar integrations with other sites, not to mention that the lessons we learn from these experiments will be helpful to any sites that want to build a similar experience. To learn more about this integration, you can read Plaxo’s blog post and the coverage on TechCrunch, VentureBeat, or ReadWriteWeb (which got syndicated to The New York Times, neat! ), and of course TheSocialWeb.tv. But I thought I’d take a minute to explain a bit more about how this integration works “under the hood”, and also share a bit of the backstory on how it came to be. For those interested in the details of how the OpenID+OAuth hybrid works, and how we’re using it at Plaxo, here’s the meat: it’s technically an “OAuth Extension” for OpenID (using the standard OpenID extension mechanism already used by simple registration and attribute exchange) where the Relying Party asks the Identity Provider for an OAuth Request Token (optionally limited to a specific scope, e.g. “your address book but not your calendar data”) as part of the OpenID login process. The OP recognizes this extension and informs the user of the data the RP is requesting as part of the OpenID consent page. If the user consents, the OP sends back a pre-authorized OAuth Request Token in the OpenID response, which the RP can then exchange for a long-lived Access Token following the normal OAuth mechanism. Note that RPs still need to obtain an OAuth Consumer Key and Secret offline beforehand (we’ve worked on ways to support unregistered consumers, but they didn’t make it into the spec yet), but they *don’t* have to get an Unauthorized Request Token before initiating OpenID login. The point of obtaining a Request Token separately is mainly to enable desktop and mobile OAuth flows, where popping open a web browser and receiving a response isn’t feasible. But since OpenID login is always happening in a web browser anyway, it makes sense for the OP to generate and pre-authorize the Request Token and return it via OpenID. This also frees the RP from the burden of having to deal with fetching and storing request tokens–given especially the rise in prominence of “directed identity” logins with OpenID (e.g. the RP just shows a “sign in with your Yahoo! account” button, which sends the OpenID URL “yahoo.com” and relies on the OP to figure out which user is logging in and return a user-specific OpenID URL in the response), the RP often can’t tell in advance which user is trying to log in and whether they’ve logged in before, and thus in the worst case they might otherwise have to generate a Request Token before every OpenID login, even though the majority of such logins won’t end up doing anything with that token. Furthermore, the OP can feel confident that they’re not inadvertently giving away access to the user’s private data to an attacker, because a) they’re sending the request token back to the openid.return_to URL, which has to match the openid.realm which is displayed to the user (e.g. if the OP says “Do you trust plaxo.com to see your data”, they know they’ll only send the token back to a plaxo.com URL), and b) they’re only sending the Request Token in the “front channel” of the web browser, and the RP still has to exchange it for an Access Token on the “back channel” of direct server-to-server communication, which also requires signing with a Consumer Secret. In summary, the hybrid protocol is an elegant blend of OpenID and OAuth that is relatively efficient on the wire and at least as secure as each protocol on their own, if not more so. Once a user signs up for Plaxo using the hybrid protocol, we can create an account for them that’s tied to their OpenID (using the standard recipe) and then attach the OAuth Access Token/Secret to the new user’s account. Then instead of having to ask the user to choose from a list of webmail providers to import their address book from, we see that they already have a valid Gmail OAuth token and we can initiate an automatic import for them–no passwords required! (We’re currently using Google’s GData Contacts API for the import, but as I demoed in December at the Open Stack Meetup, soon we will be able to use Portable Contacts instead, completing a pure Open Stack implementation.) Finally, when the user has finished setting up their Plaxo account, we show them a one-time “education page” that tells them to click “Sign in with your Google account” next time they return to Plaxo, rather than typing in a Plaxo-specific email and password (since they don’t have one). However, because Google’s OP supports checkid_immediate, and because Plaxo sets a cookie when a user logs in via OpenID, in most cases we can invisibly and automatically keep the user logged into Plaxo as long as they’re still logged into Gmail. Specifically, if the user is not currently logged into Plaxo, but they previously logged in via OpenID, we attempt a checkid_immediate login (meaning we redirect to the OP and ask them if the user is currently logged in, and the OP immediately redirects back to us and tells us one way or the other). If we get a positive response, we log the user into Plaxo again, and as far as the user can tell, they were never signed out. If we get a negative response, we set a second cookie to remember that checkid_immediate failed, so we don’t try it again until the user successfully signs in. But the net result is that even though the concept of logging into Plaxo using your Google account may take some getting used to for mainstream users, most users will just stay automatically logged into Plaxo (as long as they stay logged into Gmail, which for most Gmail users is nearly always). The concept of combining OpenID and OAuth has been around for over a year. After all, they share a similar user flow (bounce over to provider, consent, bounce back to consumer with data), and they’re both technologies for empowering users to connect the websites they use (providing the complementary capabilities of Authentication and Authorization, respectively). David Recordon and I took a first stab at specifying an OpenID OAuth Extension many months ago, but the problem was there were no OpenID Providers that also supported OAuth-protected APIs yet, so it wasn’t clear who could implement the spec and help work out the details. (After all, OAuth itself was only finalized as a spec in December 07!). But then Google started supporting OAuth for its GData APIs, and they subsequently became an OpenID provider. Yahoo! also became hybrid-eligible (actually, they became an OpenID provider before Google, and added OAuth support later as part of Y!OS), and MySpace adopted OAuth for its APIs and shared their plans to become an OpenID provider as part of their MySpaceID initiative. Suddenly, there was renewed interest in finishing up the hybrid spec, and this time it was from people in a position to get the details right and then ship it. The Google engineers had a bunch of ideas about clever ways to squeeze out extra efficiency when combining the two protocols (e.g. piggybacking the OAuth Request Token call on the OpenID associate call, or piggybacking the OAuth Access Token call on the OpenID check_authentication call). They also pointed out that given their geographically distributed set of data centers, their “front channel” and “back channel” servers might be on separate continents, so assuming that data could instantly be passed between them (e.g. generating a request token in one data center and then immediately showing it on an authorization page from another data center) wouldn’t be trivial (the solution is to use a deterministically encrypted version of the token as its own secret, rather than storing that in a database or distributed cache). As we considered these various proposals, the tension was always between optimizing for efficiency vs. “composability”–there were already a decent number of standalone OpenID and OAuth implementations in the wild, and ideally combining them shouldn’t require drastic modifications to either one. In practice, that meant giving up on a few extra optimizations to decrease overall complexity and increase the ease of adoption–a theme that’s guided many of the Open Stack technologies. As a proof of the progress we made on that front, the hybrid implementation we just rolled out used our existing OpenID implementation as is, and our existing OAuth implementation as is (e.g. that we also used for our recent Netflix integration), with no modifications required to either library. All we did was add the new OAuth extension to the OpenID login, as well as some simple logic to determine when to ask for an OAuth token and when to attach the token to the newly created user. Hurrah! A few more drafts of the hybrid spec were floated around for a couple months, but there were always a few nagging issues that kept us from feeling that we’d nailed it. Then came the Internet Identity Workshop in November, where we held a session on the state of the hybrid protocol to get feedback from the larger community. There was consensus that we were on the right track, and that this was indeed worth pursuing, but the nagging issues remained. 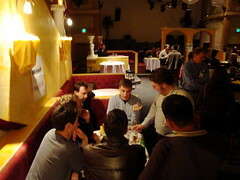 Until that night, when as in IIW tradition we all went to the nearby Monte Carlo bar and restaurant for dinner and drinks. Somehow I ended up at a booth with the OpenID guys from Google, Yahoo, and Microsoft, and we started rehashing those remaining issues and thinking out loud together about what to do. Somehow everything started falling into place, and one by one we started finding great solutions to our problems, in a cascade that kept re-energizing us to keep working and keep pushing. Before I knew it, it was after midnight and I’d forgotten to ever eat any dinner, but by George we’d done it! I drove home and frantically wrote up as many notes from the evening as I could remember. I wasn’t sure what to fear more–that I would forget the breakthroughs that we’d made that night, or that I would wake up the next morning and realize that what we’d come up with in our late night frenzy was in fact totally broken. 🙂 Thankfully, neither of those things happened, and we ended up with the spec we’ve got today (plus a few extra juicy insights that have yet to materialize). It just goes to show that there’s still no substitute for locking a bunch of people in a room for hours at a time to focus on a problem. (Though in this case, we weren’t so much locked in as enticed to stay with additional drink tickets, heh.) And it also shows the power of collaborating across company lines by developing open community standards that everyone can benefit from (and thus everyone is incentivized to contribute to). It was one of those amazing nights that makes me so proud and grateful to work in this community of passionate folks trying to put users in control of their data and truly open up the Social Web. Now that we’ve released this first hybrid experiment, it’s time to analyze the results and iterate to perfection (or as close as we can get). While it’s too early to report on our findings thus far, let me just say that I’m *very* encouraged by the early results we’re seeing. 😉 Stay tuned, because we’ll eagerly share what we’ve learned as soon as we’ve had time to do a careful analysis. I foresee this type of onboarding becoming the norm soon–not just for Plaxo, but for a large number of sites that want to streamline their signup process. And of course the best of part of doing this all with open standards is that everyone can learn along with us and benefit from each other’s progress. Things are really heating up and I couldn’t be more excited to keep forging ahead here!